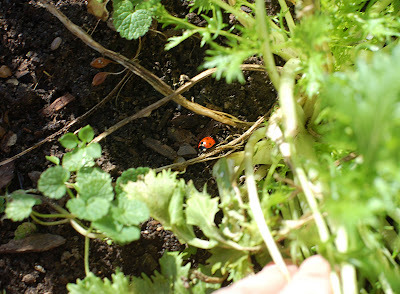 Calendula & Concrete: Where do ladybugs go for the winter? Apparently not very far from the garden! Ladybugs hibernate for the winter, according to this article by Professor of Entomology Tom Turpin. And they seem particularly fond of finding winter accommodations in the crevices and cracks of human houses. But this little guy (or gal? ), to my surprise, was still hanging around the mizuna plants in my garden today, as the cold, wintry breezes nipped at my fingers while I snapped photos. Hurry up, you procrastinating little bug, you! Find yourself a warm place and settle down for the winter. The garden needs you and your buddies come spring! Oh, I just learnt another English word: ladybug. That sounds very sweet. Let us hope that your little fellow finds an appropritate place for overwintering and you will see him back in the garden next spring.